Birthday celebrations are special. Each year these celebrations help us recognize our impact and special place in the world. I recently had the privilege of celebrating Clara Schannep Jensen’s 105th birthday with her and her family at the Chesapeake Retirement Community in Newport News, VA. Over the course of her life, Clara traveled and experienced the world in ways that few others have. Some of her most rewarding experiences took place during her time as an American Red Cross Donut Dollie in WWII. 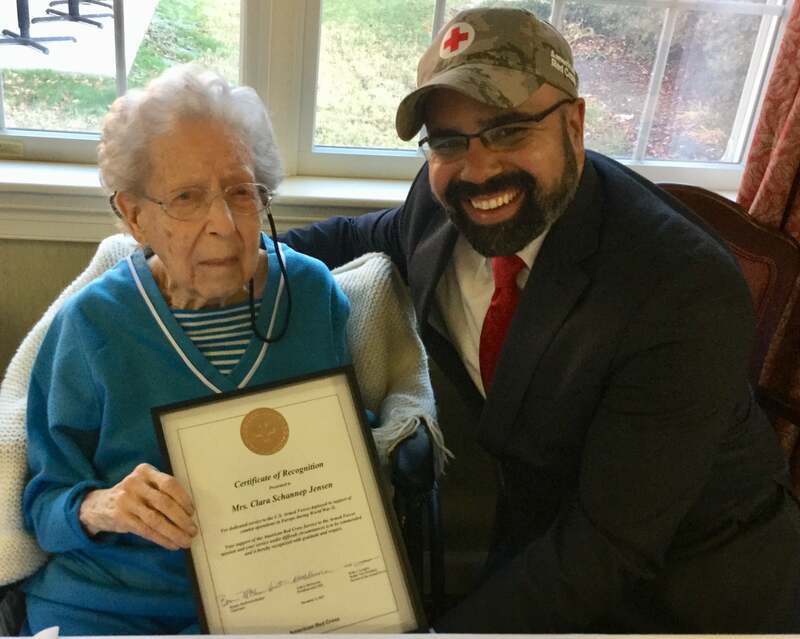 While working with the Red Cross, Clara had a front row seat for significant world events such as the celebration of Norway’s liberation from Nazi Germany. She physically sat in the gallery during the Nuremberg Trials. Her Red Cross duties also took her to London, Paris, Rome and other European cities. Clara was born on December 6, 1912, in Versailles, MO. She spent her formative years in Pilot Rock, OR, where she graduated from high school. After graduating, Clara trained in professional dance at the Perry Mansfield School for Performing Arts in Steamboat Springs, CO, and later opened her own dance studio. Little did she know that the training she received would eventually prepare her to answer her country’s call to serve with the Red Cross as a Donut Dollie. In the summer of 1946, Clara received heart-breaking news regarding her brother, Colonel Dwight Schannep. In July 1946, he co-piloted an airplane traveling from the Philippines to Japan. The plane made initial radio contact with Okinawa, but never reached its destination and was never heard from again. Months later, Clara’s father passed away prompting her to move home and resign from her position with the Red Cross. Thus, ending a career filled with commendations and awards for her service to the members of the U.S. Military. After the war, Clara married Alfred A. Jensen, a soldier she met while in Europe. Together they raised a family and continued to travel the world until they settled down in Newport News, VA. Happy Birthday Clara Schannep Jensen, and thank you for your service! Wow! Happy birthday to sweet Clara! What a special celebration. It was a special celebration indeed! Thank you, Meg. Happy, Happy Birthday, dear Clara!! Thank you from all the volunteers, you set the trend for us today!